Planning a long distance cycle ride is all part of the fun. The process takes time and patience, and all of the pieces of the jigsaw must fit together perfectly so the trip runs smoothly as often there is no back up plan. Just you, your bikes, your legs and your few possessions. Oh, and your credit card of course. The first and most important thing to do is to decide on what you want to do. Where do you want to go and what type of terrain do you enjoy cycling? We are very much hybrid cyclists. We have an aversion to hills. A lot of cyclists thrive on climbing up steep hills – the steeper the better – but not us. For us there is nothing worse. We are more the disused railway tracks (huge thanks to Mr Beeching) and canal tow path types, with a spattering of (very) quiet country lanes. We know hills are unavoidable and especially so on longer routes, but we do our level best to keep away from them. We would rather cycle 20 miles around a hill than climb 3 miles over it! Last year we cycled through Northern France (for the vast majority of the distance) and Southern England along the Petit Tour De Manche. We enjoyed it immensely and decided that this year we wanted to do more of the same, so the search was on for another European route. These types of routes which are far away from home are much easier to organise if they are circular otherwise you have the added complexity of trying to get to the start and from the finish from two different locations. It can be done but it is much more difficult. The Petit Tour De Manche is a circular route and it worked out well, so the task was set to look for a circular route which starts and ends at a location with good transport links and doesn’t have too many hills to climb. A tall order. As well as doing cycle touring I enjoy reading books about other people’s adventures in the saddle. One such book I read recently mentioned just in passing a route called Pirinexus. He was cycling a different route which shared a small part of the Pirinexus. I had never heard of the Pirinexus cycle route and it aroused my interest. The guy in the book was cycling through Spain at this point so I worked out which country it was in (which was a start) and Google told me more about it as I headed over to the Pirinexus web site. Pirinexus is in Spain (tick against continental route). It is a circular route (another tick) centred between the Pyrenees (hmm, not sure now) and the Mediterranean coast line (oooh, sounding better already). Girona airport is right on the route (big tick for good transport links). It is about 220 miles in length (perfect length for us to enjoy a tour with 5 cycling days – another tick) and the weather in May time should be fine (another tick as nobody likes to cycle in the rain). Spain is renowned for its great food (a huge tick) and wine (does it get much better?!). It was looking like a good choice for out next tour. I checked out links to Girona from Manchester and a certain Irish budget airline flies there so a direct link was available and they fly on the perfect days for the start and end days of the tour. It was all looking too easy. The pieces of the jigsaw were coming together rather smoothly. Distance each day is a very important consideration when planning a long distance cycle tour. You don’t want to have to go too far each day as it can take its toll and sap your energy. For us at least, the reason for doing long distance tours is to see new places and beautiful scenery. We like to stop and explore places and meet people so you need to make sure you allow yourself time to do the things you want to do. On the other hand, you also need to be realistic in how long it will take you. When you have a certain timescale in mind, you’ve got to make sure you get to your destination otherwise you won’t have anywhere to sleep that night and, more importantly, you will not finish the tour! Our plan is to fly from Manchester to Girona and start / finish the tour at the airport. The Pirinexus is 220 miles in length. We have 5 days to complete the tour so you’d think simple maths would give us 44 miles per day to cover. What that doesn’t tell you though is about the terrain; downhill and flat is quicker than uphill, obviously, so you need to adjust your daily mileage to reflect the terrain you will be travelling along on each particular day. You also need to take into account the flight from the UK and therefore the planned starting time for the first day. It will potentially leave you with a short first day so you will be able to cover fewer miles on day one. If you were sensible then you would also consider the fact that after three days of cycling, your legs are pretty shattered so you would be kind to yourselves and plan to do less miles in the latter part of the tour. We are not sensible so we ignored that bit. One of the main motivating factors for cycle touring is seeing incredible scenery and discovering new places. It makes a whole lot of sense to make time to visit these places, so you need to do your research before you go to work out what is where and on what day you will be visiting. The Pirinexus web site contains a fantastic 96 page guide to the route. It contains a wealth of information about what you can see and do along the route, and also, quite unusually, detailed sector maps of the route. You usually need to buy this type of stuff for the UK routes but this guide if totally free. You just download it in PDF format. You could then keep it on a tablet or your phone, or simply print it all out. We opted for the printed version so we always had it handy and bound it into an A5 sized guide that will come with us on the tour. So we had the route sorted. When you plan to go on a cycle tour, one of the biggest decisions is whether you take your bikes with you or hire them at your destination. For us, it was a nonsense question. We love our trusty hybrid bikes and can’t contemplate doing anything even vaguely substantial without them. You learn to trust your bike. They are comfortable and set up perfectly for you so to risk getting a sub-standard bike from a hire shop doesn’t even bear thinking about. Your back and rear ends won’t thank you for it. The cost of taking a bike on an aircraft is not cheap. It was more expensive to take the bikes than to take ourselves, but we think it is a price worth paying. So we would say “take your own”. Period. Don’t think twice about it. No other choice. Just do it. We had never taken our bikes on a flight before. The tours completed so far had all been either UK based, so we used conventional car mounted racks, or when we did go abroad last year we went on a ferry so taking a bike was not of concern. The Pirinexus involves taking our bikes on an aircraft. They are carried in the hold so we needed to find a solution to allow us to do that without them suffering any damage. The best option would be a hard case so any knocks and bangs do not affect the contents, but to buy one is several hundred pounds. As we are not exactly sure how often we would use it and having already having forked out a not inconsiderable amount for the flights, we were looking for a more budget option. Our first thought was to hire hard bike cases. There are a few on-line rental stores that you can hire these types of hard cases from. It would, however, add a further issue to the planning as the rental stores were all quite a distance from our home town. The worry was that we would rent the boxes for a week but only be able to get them the day before, and if there was an issue with the bikes fitting in we would have no time to sort out an alternative. We weren’t happy with that level of risk as it could jeopardise the whole trip. As well as the fee to rent a box you have to leave quite a substantial deposit. If you read the small print for the rentals there is a clause in there advising that the deposits will be kept if there is any damage to the box. Now, I don’t know about you but whenever I get my luggage back from a flight there is always some damage, no matter how small, so there was a very real risk of us paying a fair amount to rent these things if we lose our deposits. The other option to a hard bike box is a soft one. Not a bag as such, more of a suitcase. Back to Google. We searched E-Bay and Amazon. Between the two sites you can get anything you need. Literally anything legal that is – although not even that but don’t get me started. We searched for bike bags and came up with a few options. We read all of the reviews we could and settled on one particular bike bag. It was “soft” but the walls one centimetre thick so we felt it would provide pretty good protection as long as we pack up the bikes using some foam and bubble wrap around the frame. We bit the bullet and ordered two. They arrived in a timely fashion so we had a play. The bikes fitted perfectly. Better than we had both hoped. The cost was more than a rental alone but less than a rental plus lost deposit, and we now have them for any future adventures. Another piece of the puzzle was solved. So with a route sorted and a flight to the starting post in the bag, plus bags to carry the bikes in, the next consideration is where you are going to stay. As mentioned before, you need to plan your daily distances with a cool head. It has got to be achievable otherwise you will not enjoy the trip. We made the mistake once of planning a very long first day. It was the Trans Pennine Trail (TPT) which crosses from Southport in the West to Hornsea in the East. It was our first long distance trip so we were a bit naïve and we thought, “first day, fresh legs”. Unlike road cycling, the types of terrain along the trails on the TPT are rougher and slower and sap more of your energy. Our first stop over was in Stockport. It was 78 miles, which doesn’t sound a lot but when you’ve slogged along rough tracks and zig-zagged along field boundaries (and perhaps – ahem – not done as much training as you should have done), we were absolutely shattered and when we took a wrong turning to the hotel and didn’t find it (obviously) we were down trodden. This was day 1 don’t forget. We still had 3 days of cycling ahead of us. Needless to say we eventually found the hotel and spent a short evening falling asleep in our steaks and beers, and nursing our sore back sides and legs. Since that trip we have taken a sensible approach and look at the daily mile tot up with a little more respect. You need to look at an achievable daily mileage but also ensure that you end up in a town or village that has suitable accommodation. We like to have a comfy room with twin beds (we’re good mates but not that close! ), good food and a beer available in the hotel or very close by, and somewhere safe and dry to store our trusty steeds. From our experience, most hotels are very accommodating. I cannot think of a single hotel over the years of organising these long distance tours where they have not agreed to give us somewhere dry and secure to keep our bikes. As long as you pay them the courtesy of asking if they can accommodate them securely during the booking process and not just rock up fully laden and expect them to put them somewhere, then there seem to be no issues at all. So we decided where to stop each night and then used the internet to hunt out appropriate accommodation. What did we do before Google? Day 1- 47.8 miles: Girona Airport to Olot. Day 2 – 42.9 miles: Olot to Prats-de-Mollo-la-Preste. 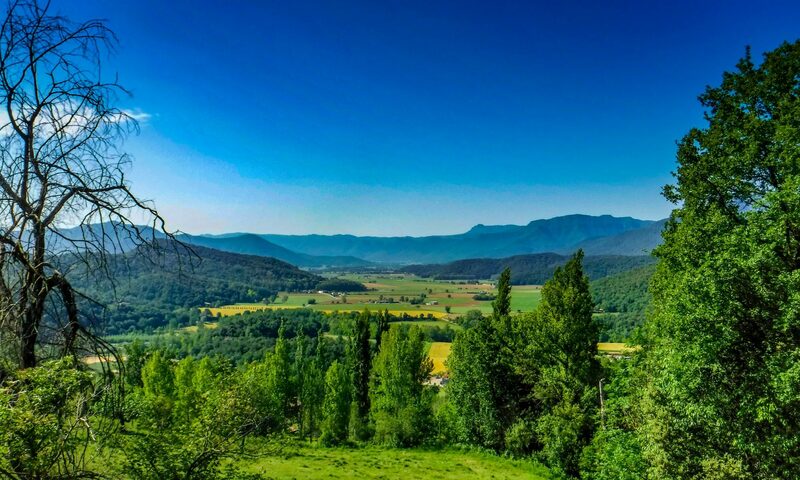 Day 3 – 43.5 miles: Prats-de-Mollo-la-Preste to La Jonquera. Day 4 – 64.6 miles: La Jonquera to Sant Antoni de Calonge. Day 5 – 26.6 miles: Sant Antoni de Calonge to Girona Airport. Day one has to have time for the airport, rebuilding of the bikes and repacking of the panniers – affectionately known as “Fiddling Time”. The hotel at Girona Airport where we are staying for our last night has kindly agreed to store our bike boxes for us for the duration of the trip which solves a huge headache for us! If you ask then you get. Days two and three are around the Pyrenees so we anticipate some climbing. Okay, a lot of climbing. We are not proud. We are happy enough to dismount and gently walk up the hills. All part of the adventure. They are shorter because of the hills. The longer day 4 is from the hills to the sea, so we just assumed it would be downhill all the way (are we being naïve again?). It will either be a long slow slog of a day, or a very quick downhill day with time for extra beers by the sea. We’re hoping for the latter. The final day is short because we will be shattered and might want a long breakfast by the Med. Our flight home is early on day 6 so we plan to get to the hotel early and do our entire dismantling and repacking ready for the flight back to the UK. So there you have it – all the ingredients for the perfect cycle tour – sun, sangria, mountains to beaches scenery, hopefully some fine dining along the way and yes, OK, we’ll have to do some cycling as well between times! Follow every turn of the pedals on our Facebook page www.facebook.com/boysgonebiking.